Listen to this track by art-rock-meets-chamber-pop trio from Calgary Alberta, Raleigh. It’s the opening track to their debut album New Times in Black and White; “Tunnel Vision”, an ambitious tune built up centered around the interlocked voices of Clea Anaïs (also on cello and piano) and Brock Geiger (guitar). Drummer Matt Doherty supports the song, and others on the record with dextrous, melodic fills. The three musicians have created an amalgam of various strains of pop music, with an atmosphere that explores the same sumptuous indie-folk musical continent as Sufjan Stevens mapped on Illinoise. There is temptation to bury them in comparisons to other bands still, ranging from Stars, to Iron & Wine, to Radiohead. Yet with the vocal chemistry between Anaïs and Geiger, and with the warm and restrained orchestral feel of cello against indie guitar, against jazz-inflected drumming, the band establish their own unique sonic landscape. They leave enough space for the voices to work their magic with melodies that urge the listener on, while also shifting in interesting directions instrumentally and rhythmically at the same time. I talked to Clea and Brock about finding each other (literally! ), about chemistry, and about the one-time event of creating a debut album. The Delete Bin: According to sources, Clea, you found Brock by following his voice as he performed with a previous band through the Devonian Gardens in Calgary. How did this experience compare to your first collaboration as singers together? Clea Anaïs: Our first collaborations were actually on each others solo recordings. Our relationship was very courteous and we sang what the other person had in mind. Currently unless we have a very specific intent for a melody, we are more interested in writing our own lyrics and harmonies. We think very differently and that helps to achieve the dissonance and surprise moments of unity. DB: The interlocking voices and melody lines carried by the two singers is a real standout when it comes to the way this song, “Tunnel Vision” comes off, and is pretty central to the sound of the band in general on the album. It sounds almost choral, like classical singing. What sources did you pull from to get this effect? Brock Geiger: Clea and I have been playing/ singing together for nearly 4 years and we’ve seemed to gain an understanding of each others’ voices and how to use them effectively together. The arrangement in “Tunnel Vision”, like the majority of the album is not set up as a lead/ backup parts, which I think creates some unexpected dynamic and movement from voice to voice. DB: “Tunnel Vision” is a great choice for an opening track, because it builds slowly, sets a tone, and goes off in unexpected directions and with multiple themes. As far as pacing goes, what was your game plan for the whole album with reference to this kind of thing? BG: With this batch of songs we didn’t consider the order of the album until after the whole thing was recorded. We took a lot of time considering different options with the objective of it sounding as cohesive as possible. When I listen to records, the moments between songs has always stood out to me; those are the moments that hold the potential to take the listener to the next “space” or anticipate what’s coming next. DB: One of my favourite elements to music on the production side is a sense of musical foreground and background, and I really get that sense with this tune. How much tinkering with the arranging and actual playing of the song was done when you approached the business of recording it, as opposed to playing it live? CA: Our live performance is essentially the same as the arrangement on the album minus some of the electric bass or keyboard tone. We didn’t have a ton of time to record so we pretty much laid down what we had. BG: We put a lot of emphasis on how to achieve dynamics with this band. Almost all of the songs on the album were worked out live before getting in to the studio and we approached the recording process to capture the sound of the trio as opposed to laying down something we would have a hard time recreating live. DB: A band featuring a cello, sort of a traditionally non-rock/pop lead instrument, can often set the tone for the music, with chamber pop being a sort of instant assumption a listener’s ear makes. Yet, your music is very difficult to pigeonhole. How did you resist the gravity of landing on just one musical style with such a characteristic set up instrumentally? CA: I don’t think we are writing music to fit or belong anywhere with anyone. Raleigh’s songwriting grows from an inward sentiment that ends up being expressed through the lyrical and musical choices we make. Cello, guitar, and drums are the instruments we are most proficient on, but we would love to work with other mediums in the future. We don’t start with a sound and work out the idea, we start with the idea/sentiment and work out the song. DB: The band is just coming off a tour in support of the album New Times in Black and White. What have you taken away from it when it comes to putting across your songs to an audience? CA: Because lots of people pigeonhole music, many audiences have an expectation of what a live band should be. Raleigh is a bit discerning, then people who love music begin to enjoy the challenge. The most fun are the people who try to dance in 7. Honestly best lesson learned from Dan Vacon (The Dudes, The Dojo Workhorse), its about the energy and engagement you bring to the audience that defines how good the show will be. DB: Raleigh is made up of three musicians who have been, and are still, active on the Calgary scene in various musical contexts besides. Yet, Raleigh has been described by you as ‘Our Brainchild’. What was it that first inspired it, and what is the constant that keeps you focused artistically on developing it? CA: Its easy to get involved in everything and way harder to be disciplined and expose your own work. Raleigh is the brain-child and heart-child because we all write and contribute the sincerity and craziness that goes on in our minds and we are lucky enough to play with others that bring it and respect it too. 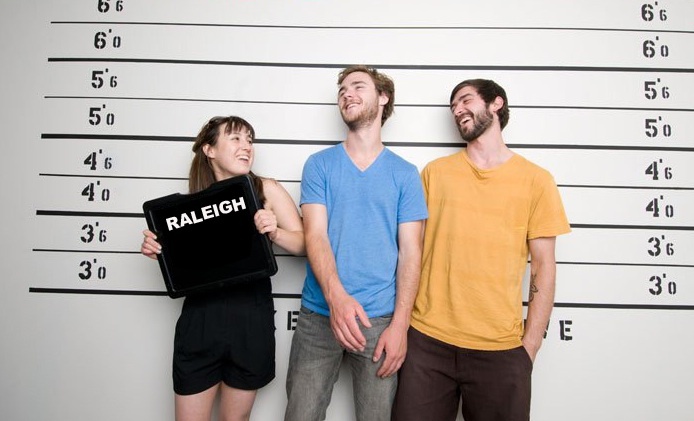 For more information about Raleigh, and more music, be sure to check out the Raleigh MySpace page. Also, consider giving the Raleigh Facebook page a ‘Like’. The band are playing the Railway Club here in Vancouver, Tuesday evening PST. I’d love to see some of you local cats there! Lovely! I look forward to seeing them tonight.